As the petition for royalization circulated the Assembly, some of the colony’s preeminent statesman weighed in. John Dickinson, who would later serve on the First Continental Congress, delivered a speech to the assembly that downplayed support for royalization and rejected the petition’s invocation of “a Spirit of Violence, Riot and Confusion prevail[ing] among us.” That speech was later published with a preface, an epitaph to William Penn, authored by William Smith, the Episcopalian priest who wrote A Brief State of the Province of Pennsylvania, ten years earlier. 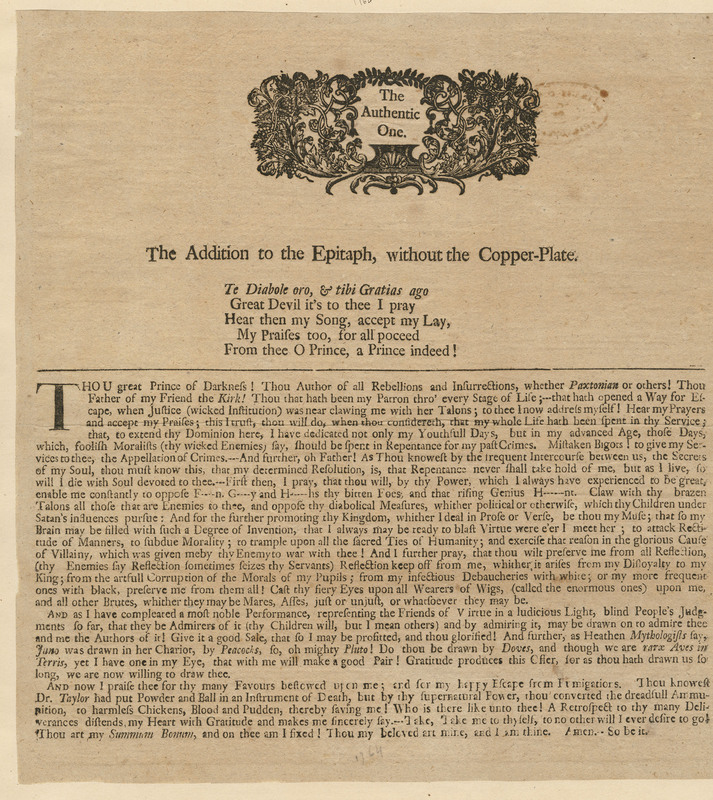 That summer, Benjamin Franklin embraced the form of the epitaph to attack the proprietors in a preface to Joseph Galloway’s rebuttal to Dickinson. The response to Franklin’s epitaph was both vehement and personal. 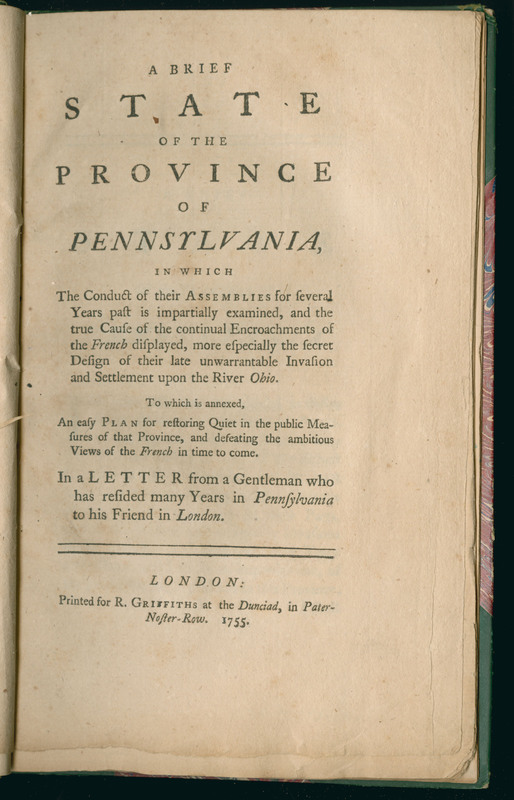 Joseph Galloway, A Speech, Delivered in the House of Assembly of the Province of Pennsylvania (Philadelphia, 1764). They refus’d the necessary Laws / For the Defence of their People, / And suffer’d their Colony to welter in its Blood ….They, / Foolishly and cruelly, / Taking Advantage of public Distress” sought “to reduce them / To the most abject Slavery. 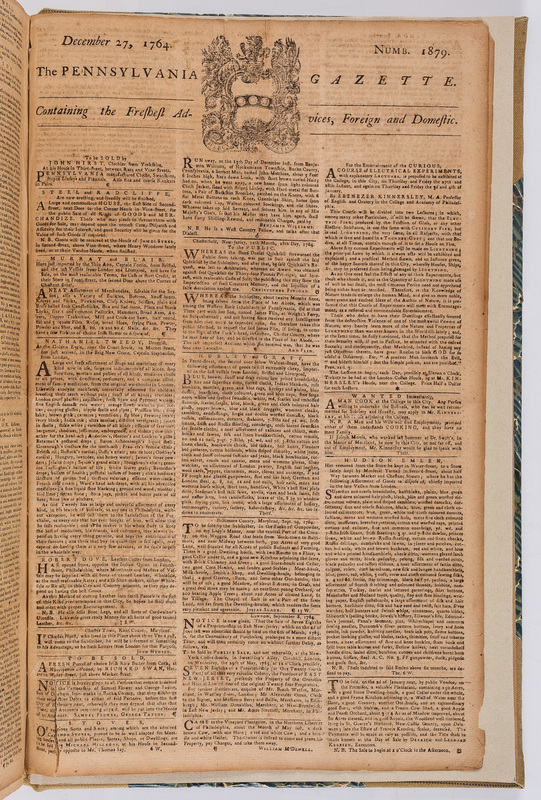 Hugh Williamson, What is Sauce for a Goose is also Sauce for a Gander (Philadelphia, 1764). 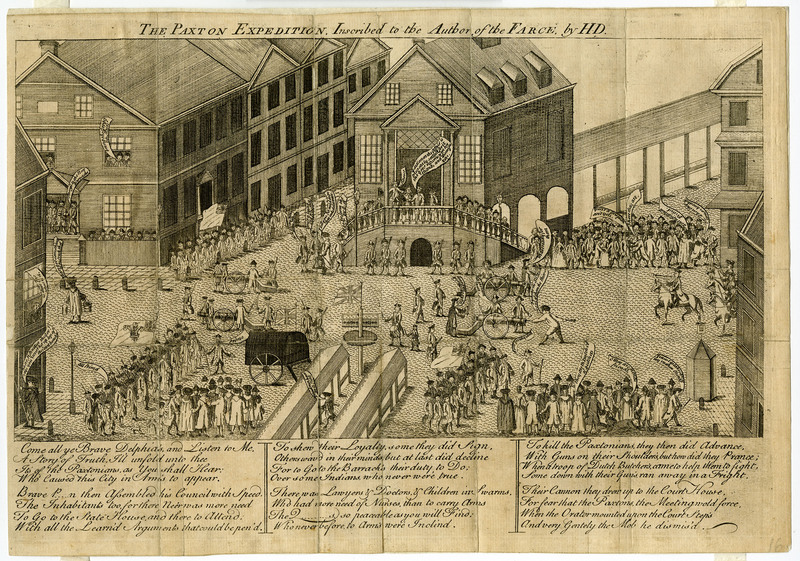 Isaac Hunt, A Conference Between the Devil and Doctor Dove (Philadelphia, 1764). Isaac Hunt, whom Peter Silver has called a “one-man pamphlet shop during the Paxton crisis,” personalized the Paxton debate. Assuming that Dove wrote Sauce, Hunt depicts Dove in a conference with the devil followed by a satirical epitaph that accuses him of sexual immorality. 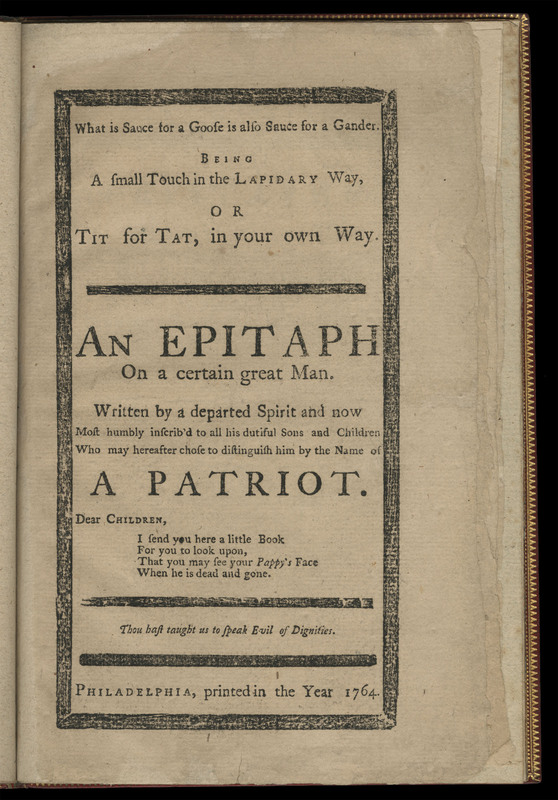 Isaac Hunt, The Addition to the Epitaph (Philadelphia, 1764). 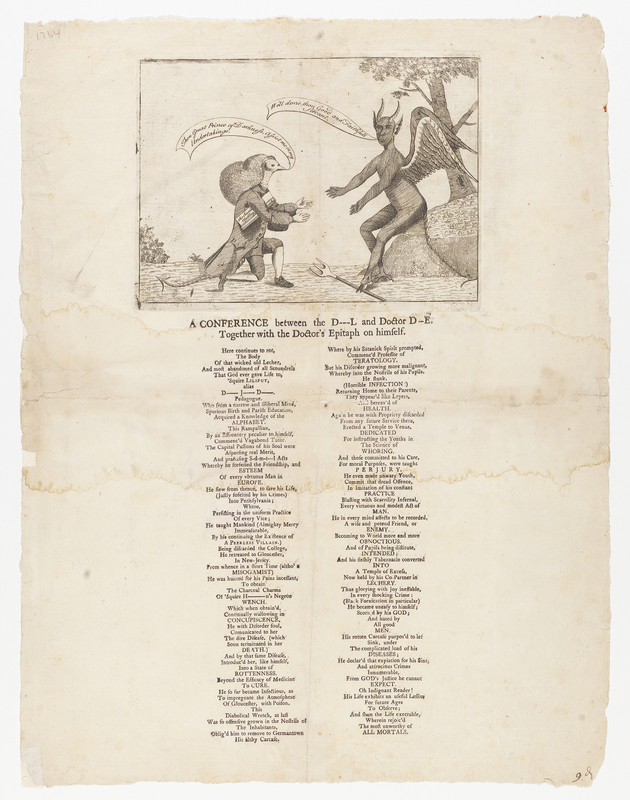 Likely intended to have been included with Conference, Hunt’s Addition showed Dove pleading for the devil’s assistance in opposing Franklin and other prominent assembly members. Continue to Democracy and Dispossession: The Legacy of the Paxton Crisis.